Last week we had a wonderful span of warmer weather–it’s the first time that all the snow has melted on the driveway and sidewalks! So of course, I start itching to get into the garden, and to my favorite store, IFA. I’m excited to get compost for the garden, I want to grow a few new vegetables and varieties this year, and I have an awesome idea for a trellis for my cucumbers. As I started making my list, I realized I need to create my garden plan, inventory and organize my seeds; otherwise I will end up making endless trips to the store to get seeds and items I’ve forgotten! This year across the top of my 4×8 bed I want to try building a trellis that spans the entire garden from the cucumbers to the cherry tomatoes in the shape of an upside-down U. I think I’ll make it from re-mesh or metal fencing. I want to try training my cucumbers up and over, which will provide shade for the plants below. Another “intensive gardening” method I’ve read about is inter-planting. This means you plant small, quick growing vegetables right next to larger, slowing growing vegetables. By the time the big plant actually gets big, you have harvested the small plants. I indicated the inter-planting vegetables with an asterisk*. So if you look at the gardens on the left–there are 4 squares including a tomato, basil (to keep away aphids) and spinach or lettuce. First of all, both spinach and lettuce get planted sooner than the tomatoes. Second, they will actually benefit and grow better if they have some shade. I also did this with the broccoli–realistically it needs 18″, which is more than one square. I will plant it in the middle of 4 squares, with beets, cilantro, or carrots around the outside. And finally, I am going to try it with zucchini and carrots. I made sure to choose plants that grow well together, or at least don’t impede each other’s growth. Last year I learned about a way to stake and prune zucchini so it doesn’t take up so much space. I tried pruning it, and it worked! So this year I’m moving the zucchini back into my square foot garden beds. I’m not sure how much space to give it, so I’ll inter-plant some carrots for good measure. 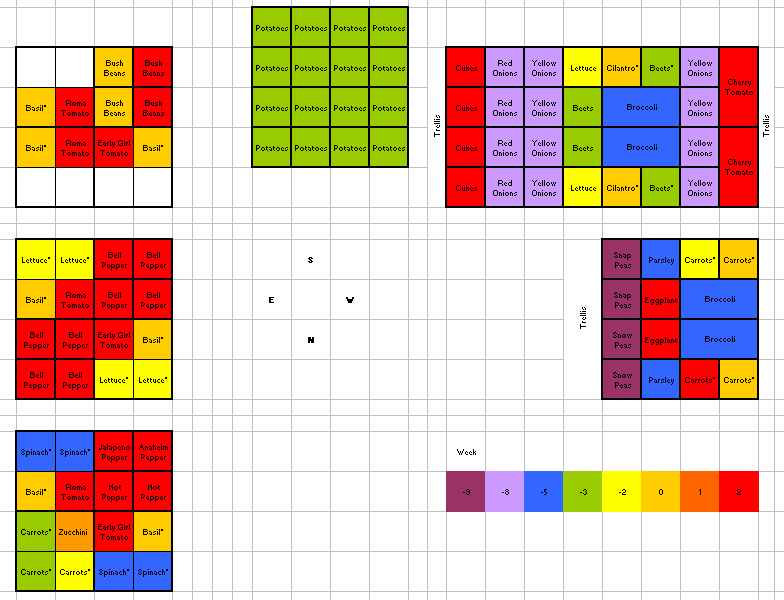 Since I’m a little OCD, I like to color code my plan according to when each vegetable is planted/transplanted into the garden. You can see most of my spring vegetables that get planted sooner (cool colors) are on the right–that is because this will give them morning sun and afternoon shade. As the weather gets warmer, late afternoon is the hottest time of the day. I hope this will extend the harvest for my lettuce and broccoli. It also means I can prepare half my gardens early in the spring, but the other half can wait a few weeks. If you look for the squares with carrots and green beans, you’ll notice they are not all the same color. I’m going to stagger the planting, so that my harvest doesn’t come on all at once, but extends throughout the summer. The soil will be lovely, though it might have a lot of weeds in it. It sounds like quite an undertaking! I generally suggest starting small, and increasing by a bed or two every year until you’re at your goal. If you chose to garden traditionally, I can recommend this book Successful Home Gardening by E. Gordon Wells. His methods are great for large, traditional gardening, and I’ve implemented his suggested fertilizing regime. If you are going to do square foot garden beds, read more about creating a garden plan, including companion planting. Since it’s far away, be sure to think through your irrigation–hopefully it will be automatic? Wow, love your site! I am a year behind you in my gardening adventures. 1st house, it came with a weed-filled, neglected garden. Deweeded (many hours on my hands & knees), and had a traditional garden, pretty good results but lots of bugs. A million seed ticks, so I put a duck in the garden. She ate nothing but ticks & fleas for a few weeks, then started in on my tomatoes. But, I’m an animal lover so I shared. (no choice really) 2nd year I did companion planting, which was a huge success. No duck, the coyotes got her the 1st night we brought in our big labs. 🙁 I also dug out pathways and created raised beds of sorts by pushing the top soil over into the beds, and put down plastic trash bags on the pathways. But walls seemed like to much work, & it didn’t occur to me to punch holes in the plastic or that the primary purpose of walls was to prevent erosion. I can almost hear the laughter through the internet at this point, yep, this highly educated person had mud rivers where my pathways had been anytime there was any rain. Lazily, I let all the leaves fall & residue from plants in the pathway so I’d have something to walk on. Turns out I outsmarted myself — those mud rivers of leaves & dead garden plants turned into the best compost ever! I had rich, black, full of earthworms soil. So, 3rd summer (2011) I simply turned the plastic trash bags over into the raised beds, built actual walls with old fence posts, and put down trash bags (yes, with holes this time) and mulch into the pathways. My garden did really well considering the horrible 115 degree heat. My garden is 20×40, with 3′ beds around all walls, and a center bed, English style. Now that you have an idea of where I’m coming from, I’m about to lose my mind and need some advice. My family has a 60 yr old cattle ranch, my husband and myself, and my cousin and his wife, now care for all the land and have our own cattle. I am working on designing a new garden up at the ranch (10-15 min away) where the old cattle pens where. Yep, should be VERY good soil, cattle pens were there for about 50 years. Nothing’s been there for at least 5-7 years. It’s full of grass, but due to the cattle being in there for so many years, it’s about 18″ high then all the land around it. It’s 40×80. There’s also plenty of space all around it to expand into. Planning a garden for 3-4 families to share, an enormous bed dedicated to strawberries, and then, next year, grapes. There’s a tree row on the south end. I’m planning to till up the whole area, and build raised beds using the existing soil, by pushing soil out of the pathways to make it raised in the center since it worked so well at my home. Would love to have your input & suggestions! Tom–this is a question I always struggle with. I’ve tried keeping track of my harvest, but often I pick food daily, so that doesn’t work so well. On top of that are weather considerations–some years (like this one) were very delayed due to cold weather. So it’s hard to say if it was the setup or the season. What I can say is that this garden served my family of 4 really well. We had all the peas we cared to eat, and more than enough green beans. We were swimming in (and loving) the broccoli. I had tons and tons of onions, which have just BARELY run out. But the tomatoes and peppers were sorely lacking. I should explain that I got tons of peppers–just before it froze and when I was already done making salsa, etc. And I had enough tomatoes to do a few batches of salsa, but I had made so much last year I didn’t need to do much canning. thanks for providing me with the ‘real world’ square foot gardening advice. Without Emily’s advice my garden wouldn’t have grown. Too bad I didn’t read her post on making the beds deeper – they do settle. 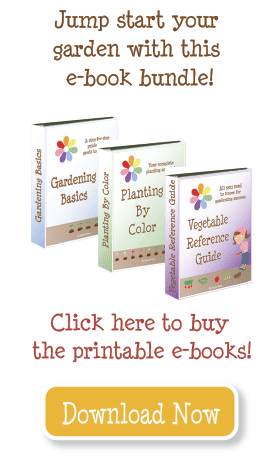 I’ve done some research on companion planting, and you can find my results here. Hope that helps! Hi I love this site I just found it today!! I am a little confused about something though. I understand about the early harvest veggies coming out before the tomatoes need to be harvested but I am confused because I thought you could not grow tomatoes with lettuce or beans? I am such a newbie that it is not funny! I started all of my plants from seed, they have been hardened and are ready to plant. Now I just need to make sure I do not plant them next to things that do not do well. Thanks for any help you can provide! Nikki–Early Girl tomatoes are indeterminate, so they will grow and sprawl all over. I do suggest using tomato cages. This kind is awesome! Peppers may or may not need support, depending on how windy it is. Instead of cages, staking them is enough. They usually don’t grow wide enough to use a cage. Karen–I recommend building boxes at least 10 inches deep. 12-15 inches is great. How much/long to compost is tricky, it depends. I’ve heard a rule of thumb is that if a bean seed will sprout, it’s safe to add to gardens. Earthworms are fantastic–add them in!!! I put weed mat down, but many worms have discovered my garden–they seem to love it. Just a note to say this site has been such a blessing to me. We will be building our first SFG this week and are using your site to assist with planning. Thanks so very much for all the time and effort you have put into sharing information and answering questions. I too am very interested in how to prune zuch. We will be using logs from down trees in our forest to build the boxes to save money and spend more on proper soil mixture using Mel’s mix & building some tomato cages with steel remesh. What depth would you recommend for someone starting out? Would like to do carrots. Also we have been composting by layering leaves, kitchen raw veggie & fruit scraps, pine straw, dirt, egg shells since last winter. Very new to composting so here are some questions – (sorry if sound silly) exactly how broken down does compost need to be; is it ok to have some straw and broken leaves in mix or is it supposed to be dirt before i use it to add to mel’s mix? (Did see on one site that they suggested using a screen to remove larger items from homemade compost. Also have lots of earth worms- should i put these into garden as well? Thanks for all help. Grace–I am really giving them 4 squares, but while they are young I will plant lettuce, spinach, basil, etc. all around them. By the time the tomato gets large those plants will be harvested (except the basil–I leave it there to repel aphids). While looking at your plan, I noticed that you have your Roma and Easy Girl Tomatoes in one square each and I was wondering how you were doing that? I thought that tomatoes needed at least 2-4 squares. I found your site while trying to remember how many carrots can be planted in a square foot, and I LOVE IT. Thanks for the great information. It’s very helpful to see how other people have organized their gardens. Happy Spring! OH I am so excited!!! This year I am focusing more on companion planting myself. Is interplanting the same idea?! Always 3 steps ahead of my line of thinking, aren’t ya? HAHAHA! Ah well… that’s why I come here to learn! I too would love to see more about the Zuch pruning!!! That would be brilliant! I only have 1 plant in my garden this year but it gets 2 sq feet to go wild instead of just 1 sq ft. I recently started my tomatoes and peppers indoors too! I used your wonderful method off your video. When I posted picks on what I did this year I linked back to your video too. Thanks so much for all the information!!! Looks like a great plan! I’m going to try to use some of the techniques your using, putting early plants in like lettuce where tomatoes will eventually fill the spot. It sounds like it should work great. I also like your color coding scheme. When I did that with my plan, I feel less overwhelmed because I can easily see not everything needs to be planted at once! Thanks for sharing your plan. You’re very ambitious. I love your color-coded graphs. I still haven’t figured out how to do one of those spread-sheet thingies. Enjoy your harvest! Daniel–I started an article on it months and months ago–I guess it’s time to finish it! Watch for it next week! Jacki–All of my garden beds except for one are about 12″ deep. In the past, I have had lots of success planting my potatoes in them. But last year I set up an Easy Garden Box, and it’s more like 14″ deep–so that’s where I’ll plant them this year. I’ve never dedicated an entire box to potatoes, but since I take out the soil and fill it in as the potatoes grow, it makes it hard to have other veggies planted nearby. I grow red potatoes, because my family loves them, and I grow whatever variety I find at IFA (local farmers’ co-op). It seems I’ve weighed and measured but I forgot how much it produced. All I know is that my family ate all we could while they were fresh, and for several months until the stored potatoes started to sprout. That’s for 2 adults and 2 kids. I’d love to hear some details about your potato bed. How deep is it? How many potatoes doe you expect to get? What type of potatoes are you going to grow? Howdy and thanks for all of the advice! So when can we see an article – or tips on staking and pruning the zucchini? The Zuke’s were one of the plants that did well for me last year (my first year at that,) but did begin to over grow their alloted area. I also interplanted some radishes in with them and they actually seemed to do better – perhaps from the shade?